It was ladies night and we were craving some good food so we decided to head to Amalfi Pizza. Amalfi Pizza was created by Greg Grant, to develop or authentic Italian menu that includes Neapolitan-style pizzas as well as appetizers, salads, pasta dishes and original desserts from Dailey’s recipes. Originating in and the true pizza of Naples in the 1600s, Vera Pizza Napoletana is 12 inches or less in size, made from simple fresh quality ingredients from the Campania region of Italy and cooked at temperatures in excess of 900 degrees in approximately 60 seconds. In addition to traveling to Naples and throughout the entire region to find the best ingredients, both Stephen de Haan and Greg Grant staged with the Italian Pizzaiolo Maestros at Pizzeria Mattozzi and Pizzeria Da Attilo. This apprenticeship, along with studying in the Associazione Verace Pizza Napoletana, has allowed their passion for food to develop the skills necessary to bring this historic, simple, and beautifully executed street food to Atlanta. When we first walked through the front door I felt as though I was instantly transported into Italy. There is a beautiful fountain and painting that makes you feel as if you are on the Amalfi coast. We walked up the stairs to get to the dining area that seats over 170 guests with large semicircular booths, custom wrought iron chandeliers along with Juliet balconies overlooking the Italian-inspired entryway. This restaurant is perfect for a date night, business or dinner with friends, or even a fun ladies night. For those who are concerned with traffic or parking, I would recommend you Uber or you can park in the garage next to the restaurant as well if you want to brave the Atlanta traffic. For our first dish, we decided to try the calamari which is corn dusted with lemon aioli sauce drizzled on top and a side of San Marzano marinara sauce to dip them in. The calamari was good and I absolutely loved the lemon aioli sauce which added a great flavor when mixed with the marinara sauce. We just had to order the Gli Amanti Della Carne (Meat Lovers Pizza), but with their signature Carnevale style. You can order any of their pizzas on the menu with their fresh ricotta stuffed crust and I promise you it won’t disappoint. The Meat Lovers Pizza comes with San Marzano sauce, spicy Neapolitan salami, meatballs, spicy sausage, house-made bacon jam, and for di latte mozzarella. The bacon jam was a fresh and sweet addition to the pizza which was so delicious. We absolutely had to try out one of their fresh and light pastas. We decided to have the Pasta Con Gambrel (Angel Hair Pasta With Shrimp) and it was so good! 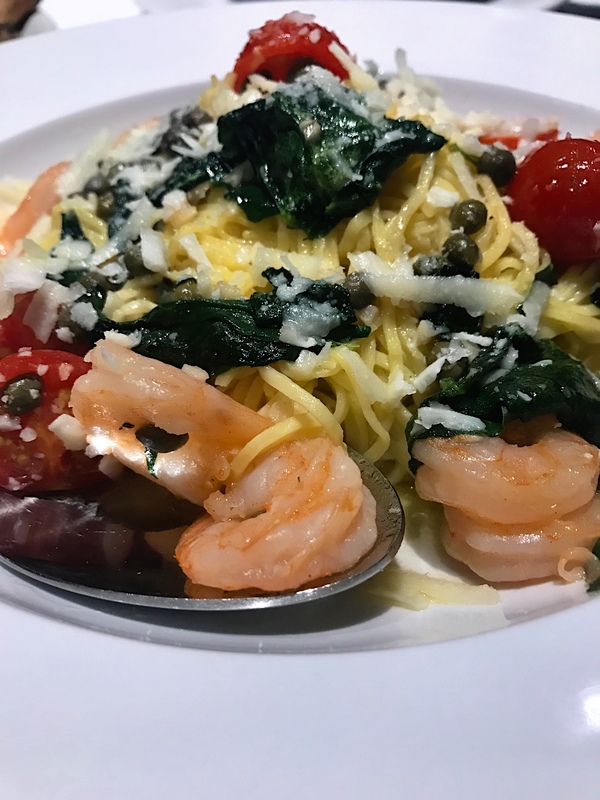 The dish comes with shrimp, tomatoes, capers, spinach, and basil tossed in a light lemon garlic sauce, served over angel hair. The capers in the lemon garlic sauce were absolutely divine and really helped tie the entire dish together. Overall, I really enjoyed this restaurant. One of the few places in Atlanta which serves true authentic pizza and pasta. The dishes are made fresh and light so your stomach does not feel heavy after your meal. You can tell the owners really wanted to honor the traditional Italian cuisine and provide customers with fresh and healthy food options. I will definitely be back to this restaurant to try more dishes. Have you been to Amalfi Pizza? What was your favorite dish? Oooh. This is really close to work so I’ll have to check it out. You definitely have to! Let me know what you think!